Artists are as follows: Knoxville X Alex Wong, Autotelic, Silent Sanctuary, Naval Brothers, Joyce Pring X Victor Pring with X-Factor, Sho Isomura X Marc Marasigan, Rico Arce X David Ardiente, Brian Cua X BSTRDPRNCE, MC Ronthug, Funk Avy, MC Pao, Ace Ramos, MVRXX, Meraki. In addition to this eclectic lineup, we’ll be giving away goodies! Pray to Lady Luck for your chance to win two (2) VIP tickets for Road to Ultra: Philippines, hot merch from Heartless PH, or a pair of the freshest kicks from SneakPeek. Damn, y’all are blessed. And you’re done! 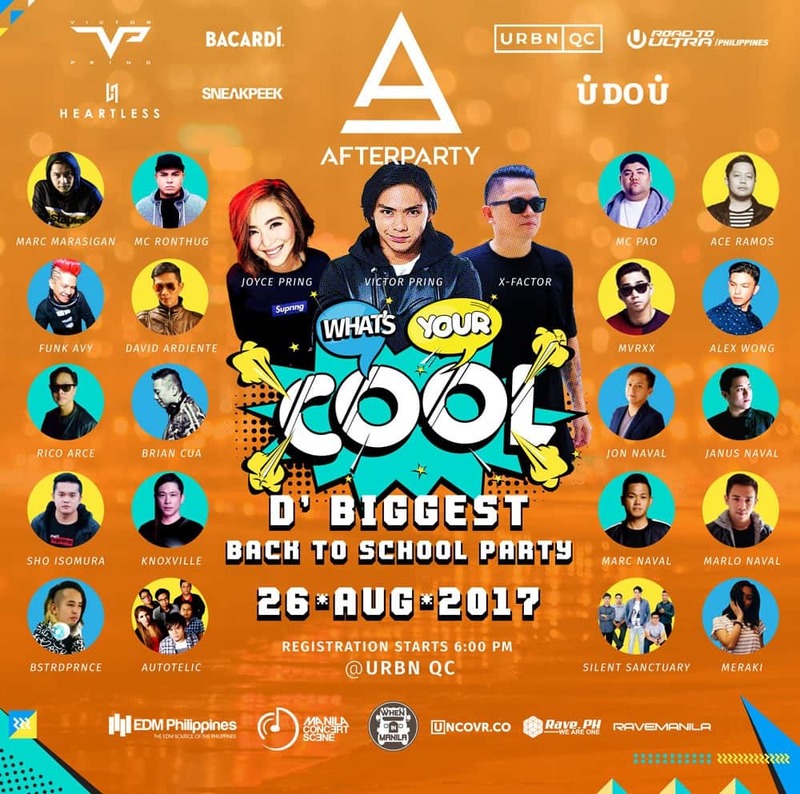 The AfterParty app is your entrance plus giveaway ticket for What’s Your Cool. It’s literally so easy, you could do it with your eyes closed. Your next question probably sounds like, “Okay, so what does the AfterParty app do?” To simplify, AfterParty is your one stop shop for the hottest events in the Metro. Ditch the FOMO, connect with your people, and win tickets plus prizes! Save your energy for something more productive—follow your favorite artists to find out where they’re playing next without the hassle of scrolling miles and miles down a newsfeed. We’re here to revamp your social media and social life to a whole new level. Come celebrate this lifestyle upgrade with us! Bring your friends and tell them to download the app, and we’ll see all your cool faces on August 26 at URBN QC!